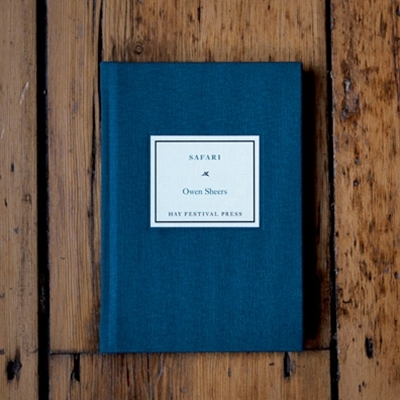 A dark teal Hay Festival Press book containing two short stories by Owen Sheers: 'Safari' and 'A Bird in the Hand'. Of the four brothels they visited that morning, Little Rose's Place was clearly the most organized. A metallic blue pick-up was parked at the foot of the stone steps leading up to the entrance. The truck had been pimped; black windows, thick tyres, chrome bumpers and an orange logo running the length of each side: Bad Boyz Security. Two men slouched in the cab. Another four sat in the open back. All of them wore sunglasses, thin vests, jeans and flip-flops. When Peter and Tiisetso got out of their own car and walked past the truck six pairs of eyes followed them up the steps and into the lobby. Peter saw the barrel of a shotgun resting between the legs of the driver like the nose of a loyal dog dozing in the footwell.